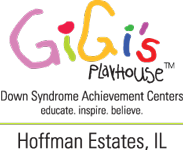 For more information regarding the Amina Grace Speech and Language program, please contact the playhouse at 847-885-7529 or programshoffmanestates@gigisplayhouse.org. The GiGi’s Playhouse Amina Grace speech and language program provides youth, teens and adults with greatly expanded opportunities to evolve and refine their speech and language skills. Effective enunciation, clarity of speech, word order and message meaning are paramount to fostering greater self-confidence, comprehension, problem-solving, school readiness, social skills, independence, and overall quality of life. Increase clarity of speech and enunciation through a hierarchal approach of repeated exposure and practice of target sounds, focusing on accurate placement of oral articulators. Improve word order and message meaning through focused exercises targeting various parts of speech, including: verb tense, word choice, sentence completion and more. Increase comprehension through the use of various visual models and tasks targeting functional level-appropriate targets. Increase self-confidence through positive reinforcement and various forms of appropriate supportive methods, including: verbal, visual and tactile. Improve school and social readiness through activities and goals geared towards preparing participants for skills required within their age-leveled school grade, thereby, increasing their chances of improving social skills of blending with classmates. Increase independence and overall quality of life through confidence-building activities, self-help skills and a positive-reinforcing approach to therapeutic targets. The Amina Grace Speech and Language Program came to be by the generous donation of Munawar Ali and Maura Cullen in honor of their daughter Amina Grace. Since its inception in the summer of 2015, the Amina Grace Speech and Language Program has serviced over 125 families through 1,250 lessons. The Amina Grace Speech and Language Program is open to participants of ALL AGES and runs in four 10-week sessions throughout the year in a 1-on-1 setting. This program, like all others at GiGi’s Playhouse, is provided completely FREE OF CHARGE to all of our participants and families!